Save for a handful of teams, most backfield situations are in a constant state of flux when it comes to making fantasy football lineup decisions and waiver claims. Entering Week 4 of the NFL season, we are starting to get a clearer sense of the workload distribution for running backs across the league. The goal for this weekly piece is to arm you with the key PFF data points to be able to earmark which RBs are trending up, and which are trending down. As always, you’ll want to consult Scott Barrett’s weekly starts and sits along with Jeff Ratcliffe’s waiver wire advice. While the names below in the “trending up” section are certainly worth rostering, not all are intended as plug-and-play starting options for this coming week. Still, it’s always preferred to be too early with a speculative add than too late. Likewise, don’t feel like you should go right out and drop anyone “trending down,” but rather, there are some red flags to consider. For example, perhaps your leaguemates aren’t keen on those red flags and are willing to meet your price in a trade offer. Before we dig into Week 4, let’s take a quick look at how things played out for the running backs we broke down last week. Notes: Phillip Lindsay was ejected for throwing punches in a scrum, which resulted in more action for Royce Freeman. 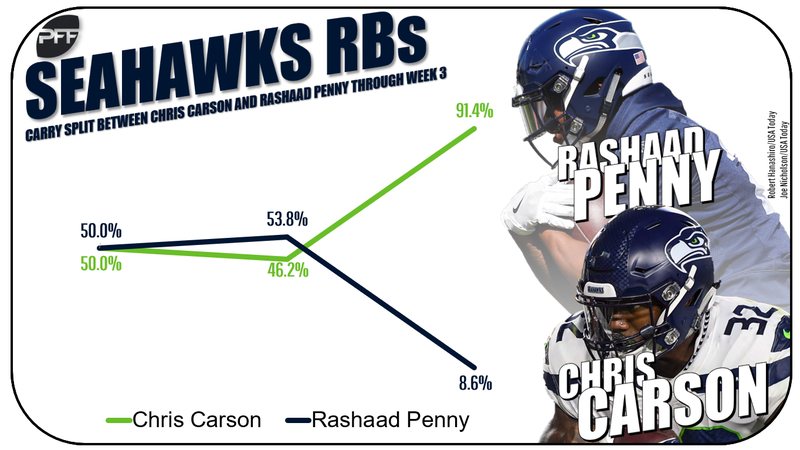 … Rookie Rashaad Penny put the ball on the ground in the first half against Dallas and wound up getting out-touched by Chris Carson, 34-3. Such is life in Pete Carroll’s doghouse. … Not a bad day at the office last Thursday for Carlos Hyde, who celebrated his birthday with a couple of touchdowns and the birth of his child. …Green Bay’s backfield is now a three-headed monster. Yuck. … Rex Burkhead was already surpassed by Sony Michel prior to being sent to going on IR with a neck injury. Here’s hoping you scooped up Johnson a couple weeks ago after the first installment of this series, as he’s now owned in three-quarters of leagues. A bona fide RB2 moving forward, Johnson has seen his touches increase each week, from eight to 13 to 18. He’s mentioned here again mostly because it’ll likely be my last opportunity to talk about him in this space while not yet a household name. Still just 21 years old, Johnson blends superb vision with a three-down skillset. Operating behind PFF’s fifth-ranked O-line through three weeks, Johnson saw nine of his 16 carries against New England go for five or more yards this past Sunday. Meanwhile, LeGarrette Blount posted our fourth-worst RB grade in Week 3 and is averaging 3.0 YPC to Johnson’s 5.6. While the early results have been a mixed bag, Morris is tied for 15th in the NFL with 40 carries (3.8 YPC. In fact, he has out-snapped (89-84) and out-touched (42-39) teammate Matt Breida. Morris is also coming off his best performance as a 49er, having earned our highest rushing grade in Week 3. Then again, Breida had the highest grade the previous week and figures to remain plenty busy in the passing game with C.J. Beathard’s tendency to target RBs. Can San Francisco’s offense support two fantasy backs? That remains to be seen, and it will certainly depend on game script. As it stands, Breida was held out of Wednesday’s practice with a knee injury. A textbook gamescript-dependent fantasy back, Henry has logged 18 carries in each of the Titans’ two victories compared to only 10 carries in the team’s lone setback. At the moment, Tennessee is a four-point home underdog against the Eagles, with RT Jack Conklin set to return and Marcus Mariota getting healthier. While off to a slow start (3.0 YPC), it’s worth noting that Henry is the only RB to finish top-10 in elusive rating in each of the last two seasons. Some positive regression can also be expected in the touchdown category, considering the Titans have totaled only two rushing attempts inside the 5 so far this season. Should it really be all that surprising that Drake sits outside the top-30 fantasy RBs entering Week 4? It’s not so much the presence of Frank Gore as it is the overall state of the Dolphins offense, which has run the second-fewest plays from scrimmage. Somehow, they won a game this past weekend despite just 39 offensive snaps. That simply doesn’t leave much margin for error for Drake, who is averaging 3.5 YPC and has seen his volume dip each week, from 17 touches to 15 to seven. Drake has not reached 100 rushing yards since his back-to-back breakout games last season, which also marked the last time he saw 20 carries in a game. With Devonta Freeman (knee) nearing a return, the clock is winding down on Coleman’s window as a plug-and-play RB1 in fantasy. You’re still starting him on Sunday against Cincinnati, but no back has posted a worst rushing grade over the past two weeks (43.6) than Coleman, who missed a blitz pickup against New Orleans and put the ball on the ground a week earlier. What’s more, Coleman has eluded only three tacklers in 47 touches. In other words, in Freeman’s absence he’s become a Lamar Miller-esque volume play. While I never quite understood all of the preseason Wilkins buzz, his early-season performance has been especially uninspiring. Not only did his touches dip for the second straight week this past Sunday, Wilkins also posted a bottom-10 rushing grade in Week 3 (56.3). He ranks outside the top-50 in elusive rating, having forced a missed tackle on only 5.4 percent of his 37 touches. For what it’s worth, Nyheim Hines hasn’t fared much better in making defenders miss (7.4 percent). Marlon Mack appears on track to return this week, but all things considered, it hardly matters who is running behind a Colts’ O-line generating only 1.6 yards before contact. According to our predictive analysis research, blocking has a stronger correlation to ground-game success than individual RB performance. The Patriots have struggled to find their footing on offense, ranking 26th in both points and yards and 28th in plays per game. White has had his moments, although he owns the league’s fifth-worst elusive rating on the season, with only a 7.4-percent missed tackle rate and an average of 1.46 yards after contact. Granted it doesn’t change a whole lot for White’s projected usage in PPR – particularly with Rex Burkhead now out of the equation — but Sony Michel logged 74 percent of the team’s carries in Week 3. The team didn’t invest a first-round draft pick on Michel to be a situational back. Collins was drafted in RB2 territory this summer, and he’s been exactly that through three games, ranking 21st in PPR formats. However, his leash may not be as long as it was last season, when he was one of the league’s toughest backs to bring to the ground and averaged 18 touches over a 12-game stretch. While he’s remained slippery, forcing a missed tackle on 32 percent of his touches, Collins ranks just 49th in PFF run grade out of 58 qualifiers. Week 3 was the first time he logged double-digit carries, and he’s averaging a career-low 3.4 YPC. In addition to Collins’ limited role on passing downs, teammate Javorius Allen is stealing some thunder down near the goal line. While Collins has been given just one carry inside the 5, Allen has four carries from that distance and has scored on three of them, along with a receiving TD.